On the television, fishermen were pulling pots of pink and orange crab like giant spiders onto the decks of ships that rolled and bucked over white-crested waves. "Looks scary," the security guard said. His mouth was round and pink, his face clean-shaven. He wore a blue uniform shirt with gold insignia but had no holster on his belt. "Sca-ry." The guard said the word slowly, as if that would help. Jake shrugged. He wondered what the guard thought was more frightening—being in charge of security without a gun or having a deaf kid in his waiting room. The guard fiddled with the television remote until he got the captions to work on the screen. The guard signed back. "You're welcome." Jake couldn't hide his surprise, heat rising to this face as he considered his misjudgments. "You are cool," he signed. The guard gave him a thumbs up. 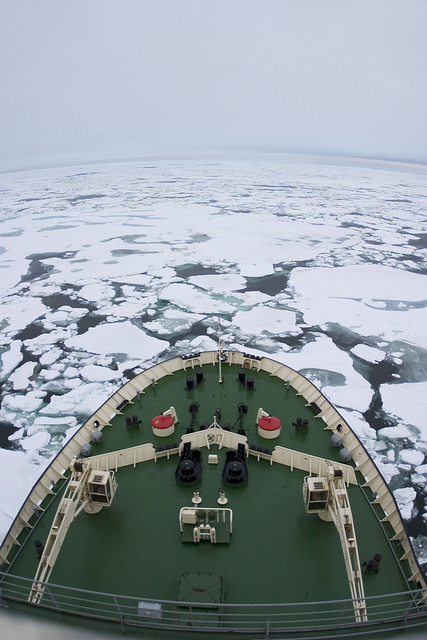 The crab ships fished in a place called the Bering Sea. At night, the sea was black and foamy and the fishermen pulled their enormous pots from the deep water. In the daylight, the water was the color of blue metal. Swells exploded like fireworks over the bows. One ship sailed further north than any of the others until there was ice all around in jagged, flat blocks, and the fishermen were able to step off the deck and walk on the floating ice in the middle of the sea. Jake was waiting for the Crab Count to see which crew had caught the most crab, when his mother returned with a handful of paperwork and a set of keys. "We're going," she signed. I've worked on this piece off and on for a number of years, so I am thrilled for its first-publication home to be in this journal. Hawai'i Review has been a source of inspiring writing for me over the years. The story itself—like so many of my stories—came about as the result of several real-world circumstances. The first was a fire, involving a semi-truck and a mattress. The second was that there was a period of time in my life when I had a large group of deaf friends, during which I was learning to sign. The third was/is my ongoing nerdy love for Discovery Channel's documentary, Deadliest Catch. I've been a fan since Season One, back when there were no sponsor ads for each show segment. I adore the series—all of it. Perhaps on another day, I'll dedicate an entire post to its virtues. In the meantime, these three "happenstancial" circumstances somehow crossed in front of me, and my writer-brain put them together to make a story. Sometimes, that's how it works. 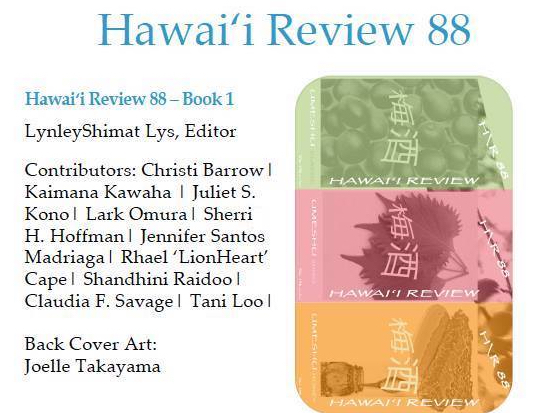 Read the full story in Hawai'i Review 88. The print issue is available now at the University of Hawai'i at Mānoa. 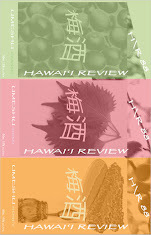 The online issue will be available soon at hawaiireview.org.